THE OIREACHTAS COMMITTEE on water published its final report a fortnight ago, after months of contentious debate, and amid ongoing controversy. One of the major provisions in the report was that the 2007 Water Services Act should be amended so that “incentives, levies or other measures” can be deployed against the “excessive use” of water. The threshold for excessive use, the committee said, should be set at 1.7 times the average household use, but this must take into account that the average consumption per person is 133 litres per day. Is that really what the average individual in Ireland uses each day? And where did that figure come from? In this FactFind, we’ll examine the committee’s now-famous figure of 133 litres per person per day, and look at some of the best estimates for average water usage in Ireland. In calculating average water use, there are two major decisions to make: whether you include houses with or without leaks, and whether you use the mean or median. We’ll take a look at all of these. 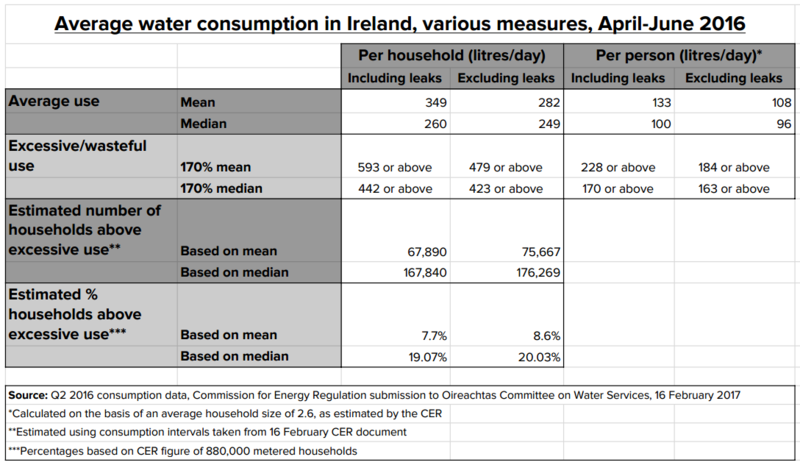 In a submission to the Oireachtas Committee, the Commission for Energy Regulation (CER) estimated that, including outliers (that is, households with water use so high it’s likely to be cause by leaks), the average (mean) consumption per household from April-June 2016 was 349 litres per day. April-June 2016 is the most recent period for which figures are available. According to the CER, the average household contained 2.6 people, which means the average (mean) consumption per person was around 133 litres per day. That’s the source of the Oireachtas Committee’s much publicised figure. However, it has to be noted that household size figures are based on 2014 Irish Water registrations, so they are three years old, and based on self-reporting. The median household usage was 260 litres per day. The median is the level that half of households are above, and half are below. It is often a more reliable indicator of normal use than the mean, because it mitigates against outliers at either end of the scale. This average (median) works out as exactly 100 litres per person per day. In the same document (on page 3), the CER presented consumption figures that included only houses with leak alarms installed, and so excluded households that use so much water it’s likely (though not certain) to be caused by leaks. When you exclude leaks, the average (mean) consumption was 282 litres per household per day. This works out as roughly 108 litres per person per day. Median consumption, meanwhile, was 249 litres per household per day, which roughly equates to 96 litres per person per day. The committee has decided that there should be a charge or levy where a household uses 1.7 times the average. Both Fine Gael and Fianna Fáil have claimed that any charge or levy for wasteful or excessive use would only apply to 8% of households. Fianna Fáil’s Housing and Environment spokesperson Barry Cowen said “92% of people, plus, will never receive a bill again”. The source of this figure is again data presented to the committee by the CER, and available here. So we’ve taken the average consumption figures we presented above (mean and median use, including and excluding leaks), and applied some calculations to figure out how many households would be 1.7 times above all four measures of average use. As you can see, the average used by the Committee – 133 litres per person per day – means that just under 8% of households would have consumption of 1.7 times the average, or above. This works out as around 68,000 households, based on April-June 2016 figures that include leaks. However, this is the lowest estimate of the four averages. If you exclude leaks from the calculations, around 76,000 households would fall into the “excessive use” category – some 8.6% of households. The rationale behind excluding leaks from the figures is that this may give a fairer picture of normal average household water use, as opposed to simply what a water meter counts as being used, even if leaks are partly responsible for it. Furthermore, as leaks continue to be fixed, average consumption including leaks will naturally begin to move closer to average consumption without leaks. So excluding leaks from the calculations now may give a better sense of what average use (and therefore excessive use) might end up being in future. As the table above shows, using median household consumption, as opposed to the mean, has a significant effect on the number of households that would fall into the “excessive use” category, if that threshold were set at 1.7 times the median. Remember that median consumption is the level of consumption that 50% of households are above and 50% are below. It can often give a better picture of normal usage, because it mitigates against extremely high or low consumption levels. If we include leaks in our calculations, an estimated 168,000 households would fall into the category of “excessive use” – that is, 1.7 times the median, or more. That works out as around 19% of the estimated 880,000 metered households in Ireland. And if we exclude leaks, we get an even lower median household usage, and therefore an even lower threshold for excessive use – meaning roughly 176,000 households (20%) would be liable to a charge for excessive use. When we talk about “average use” of water, there are really four different kinds. And because of these four different averages, we get four different possible thresholds for “excessive use”, set at 1.7 times the average. If we apply these to CER consumption figures, we can calculate a rough estimate of how many households would be above the “excessive use” threshold. Figures on the number and percentage of households in various “excessive use” categories are estimates. They don’t come from the CER or Irish Water, though they are extrapolated by us from CER data. Email “FactFind: How much water do we actually use?”. Feedback on “FactFind: How much water do we actually use?”.